Olive Bieringa from BodyCartography Project talks about her new Toi Art commission, Follow, with Te Papa’s Sarah Farrar, Senior Art Curator, and Daniel Crichton-Rouse, Senior Digital Editor. SF: How do you describe yourself and your practice? 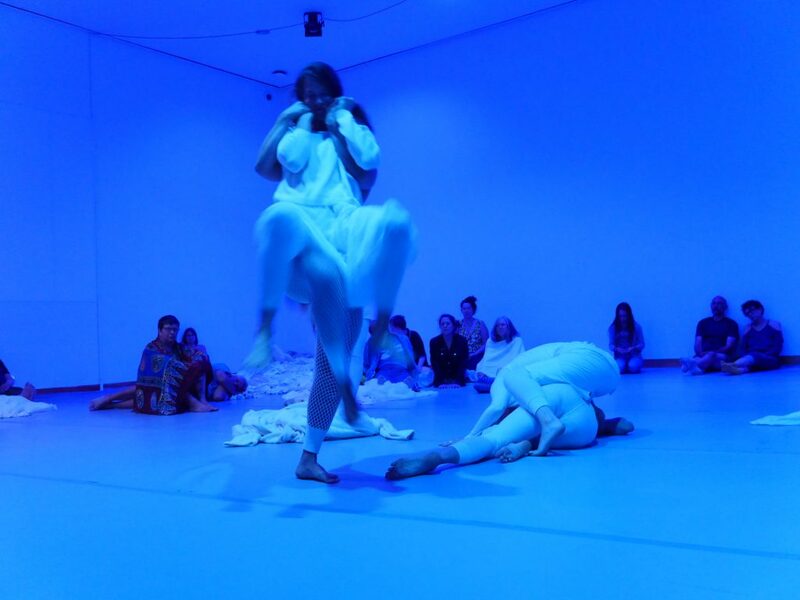 I call myself a dance maker – but I make installations and films and performances and I curate things, so there are a whole range of outcomes; but the source, or the beginning, is really this conversation about our bodies, embodiment, and movement. I grew up here in Wellington. I left and started to travel when I was 18, and became fascinated with history, culture, art history, and things I didn’t understand or have much exposure to. I travelled to Egypt and worked on a diving boat in the Sinai, in Israel found family and attended a religious school for a couple of months, opened a squat in London, and then ended up in a very experimental dance school in the Netherlands. SF: What was the name of the school and where in the Netherlands was it? It was originally called the Center for New Dance Development, and it became the European Dance Development Center, in Arnhem. As students, we came in for four years, and the first year was a set program where we worked with different artists, to study video, body awareness, and composition. Artists would come and develop work, and we would tour all around Europe, or go perform in New York City. It was here that I was first exposed to Body-Mind Centering®, which is the somatic movement education form that I have been engaged in for 20 years. DC-R: What do you mean by ‘somatic movement’? Somatics is about looking at the experience of the lived body, versus studying the body as an object. Somatic practices include Feldenkrais, and Alexander Technique, Body-Mind Centering®, amongst others. Body-Mind Centering® uses touch and movement exploration to access all the different tissues in the body, as a way to expand our cellular consciousness. For example: How do you move from your bones? How do they help you move in gravity? How can you touch your bones? How do you move from your organs? How do you move from your intercellular fluid? People train in this approach to become movement therapists, educators and bodyworkers. I’m a certified practitioner and teacher of this work, and I teach in certification programs of this work around the world as well as seeing private clients. I also have an MFA [Master of Fine Arts] in Performance and New Media from Long Island University in Brooklyn, New York. DC-R: As your performances are responsive to the environment, they’re all quite dramatically different – are there common themes and threads? Do you mean the works themselves are dramatically different from each other? That they’re different from each other? SF: You don’t think so? I don’t think that at all. I think the medium changes, and I think the medium informs the message, and it informs who the audience is going to be, but I actually think that there is a core set of values that continue to play themselves out through different projects. For me, there are a couple of really cool pieces to the somatic work that I can’t shake, and one is the developmental piece, an educational piece that often informs the structure of our work, and that has to do with how people perceive, and how we bring them in to what we’re doing. I feel that the understanding of how we develop can inform how we can bring people in, and look at these questions of engagement, agency, and “audiencing”. How do audiences look at work in the museum versus work in the theatre versus art work that’s happening in public space? How do we behave differently in those frames? How do we give things different qualities of attention? I’m really interested in highlighting that and I think the piece, in terms of the sensory piece – a visual seeing – is based on everything we’ve learned through our other senses. DC-R: Do you mean develop as in human development? Human development. Us growing inside our mothers’ bodies. Our ability to perceive movement happens first, our kinesthetic sense develops in our proprioceptors in our joint spaces, interoceptors in our organs, and vestibular system in our head. Next comes touch, in our skin all over our body. Our sense of smell and taste bring us into our midline and head via our nose and mouth, then our ears and hearing develop bringing us into stereo through the sides of our head, and then our seeing develops last. Each sense bringing us higher in our brain structure from the stem to the cortex. We begin to understand our world based on how we are able to move through it, how it feels to our touch, how it smells, tastes, and sounds. How we understand something visually is informed by all of our knowledge acquisition that came through earlier sensory input. 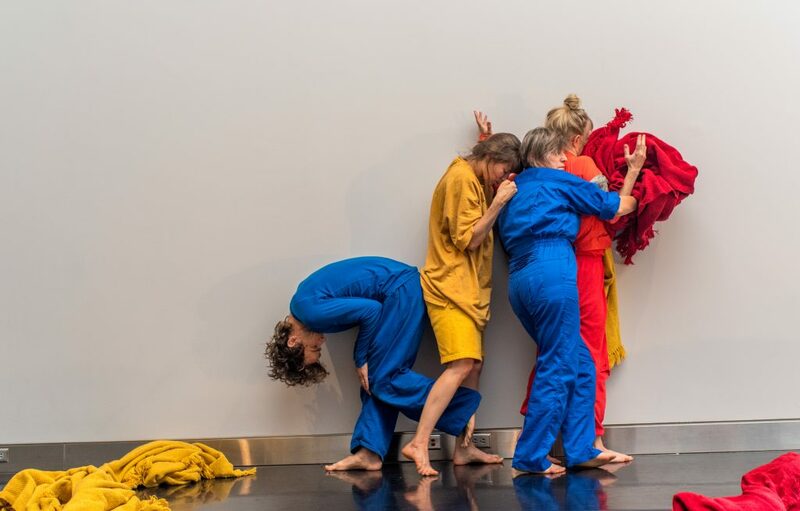 SF: We often think art galleries are mainly about sight – seeing and viewing – so what does BodyCartography Project’s latest work for Te Papa offer in terms of an experience of viewing an art museum or an art exhibition? The most obvious thing that we know about the work right now is that it is a one-on-one guided walking tour, led by a dancer, and that you’re opening and closing your eyes as you move through the galleries. So I’m actively removing the possibility for you to have vision – but you can always within that, of course, have ‘vision’. You’re still seeing things, through your eyelids and in your imagination. How can we go underneath of how we see and understand all the other influences that are feeding our understanding of how we see, to open and transform our experience of the museum and the objects it houses? I think the invitation of the work that I’m making is to create a different frame, and that you can within that frame have agency to put together what you’re experiencing – just like with any art work you really have agency to interpret it how you want – but you’re coming into a space in a relationship with another person and together you’re kind of making something, a new way of being in the museum, a way of feeling the museum. SF: I want to ask you about the idea of ‘the tour’. They’re a standard thing that museums and art galleries offer visitors, but what you’re doing is playfully subverting the conventional tour. Artists have been known to develop them – Andrea Fraser being a really well-known example, who created museum highlights for MoMA and a version of the Tate’s collection tour as well – so how much are other examples and other artists present in your thinking as you’re developing projects? This piece is really informed by an earlier work called action movie that I developed two years ago, a cinematic version that unfolds in public spaces. It’s a repositioning of looking at this idea of how we can bring people into the idea of a dance or into the idea of a movement experience that they don’t necessarily have to dance in, but it still gives them an understanding of what it is to be within an embodied process with another person as a way to transform their perceptual experience of the world. There’s a long tradition of dance in the museum, but I think in terms of dance history and in this larger critical discourse around art history, dance has not been a part of that conversation. 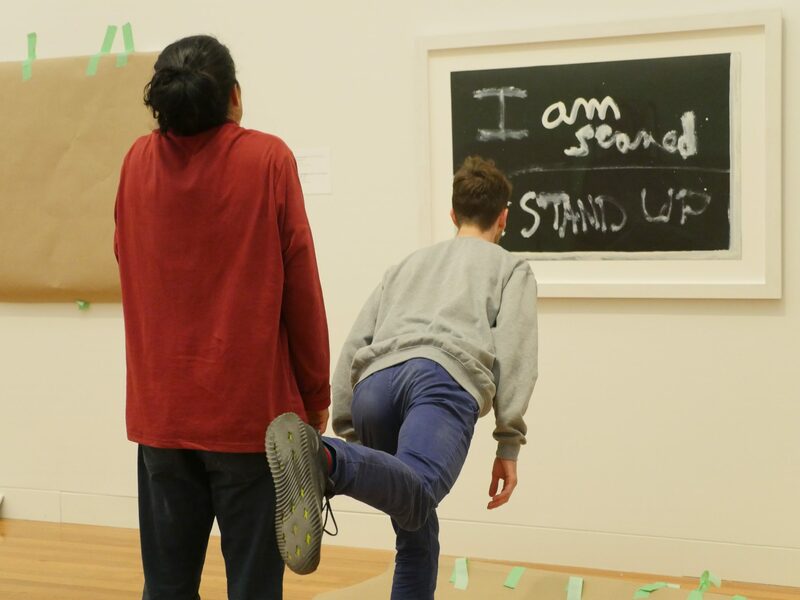 It’s always been separate, so there’s a political motivation, or a personal agenda, that I have to really bring the word ‘dance’ into the conversation and into the history of the institution of the museum. DC-R: How will your work sit in Te Papa’s collection? It will be present in the galleries, every eight weeks or so, people will be welcome to arrive in the galleries and take a performative walking tour, to experience the work live, and it will last for maybe 20 minutes. I think it’s going to take place throughout 2018 and into early 2019. After that I don’t know, but I’m curious to see how it will evolve over time. The work will sit in the collection as a series of instructions that we develop that can be re-performed in the future, according to certain parameters, but that recognise it as a responsive work that will depend on who the dancers are or who’s giving the tour, and also what’s on display… And that it doesn’t exist as documentation, it only exists in the live form. DC-R: From watching your rehearsal tour yesterday I found the experience to be quite intimate, watching the relationship between you two during the tour, how it unfolds… Do you have any memories of any of the works that you’ve done in the past of extraordinary moments that have happened during a performance? I think it’s a very interesting question because with memory… my memory of something that I thought was extraordinary might be totally not so extraordinary for the viewer, and they actually experienced this other moment as being completely extraordinary. There’s a very interesting process after a performance where you could hang out with the person, process your perceptual experiences, recognising shared moments in time. I remember a moment where I performed the work for the first time and I was down by my viewer’s feet, and I was outside on the street and I blew air, and it moved all this dust and leaves from behind her to in front of her… That was an extraordinary moment [laughs]. I think that the magic that happens because of who this person is and who I am, it’s never ever going to be the same, based on the parameters of our instant relationship – instantly we are doing this thing together, and we have to negotiate it together, so that’s going to inform so much of what happens. For me, it’s full of discovery and for the other person they’re having a completely different experience in a way. I can’t make any assumptions about what they’re experiencing. And I love that. There’s a magic somehow in the gap that is really important. DC-R: Do people who have experienced your work before come back to experience it again? We have created three different one-on-one works which have all been improvisational so the content is never the same even if there are shared strategies and scores, so people love to experience the work multiple times with different performers or at different locations. Things have changed so much since we started working 20 years ago because of the mobile phone. Most of our early work took place in public space or was site-specific. There was a period where we worked more in the theatre and more with video, and recently we have returned to making work in public space. All of a sudden everybody has phones, and they only want to watch you through their phone. I think for this piece I’m going to ask people to turn their phones off so that it’s not a mediated experience in any way, because it’s very hard to have a relationship with somebody through the camera. What happens when we share time in a non-verbal frame with a complete stranger? SF: What should visitors expect? 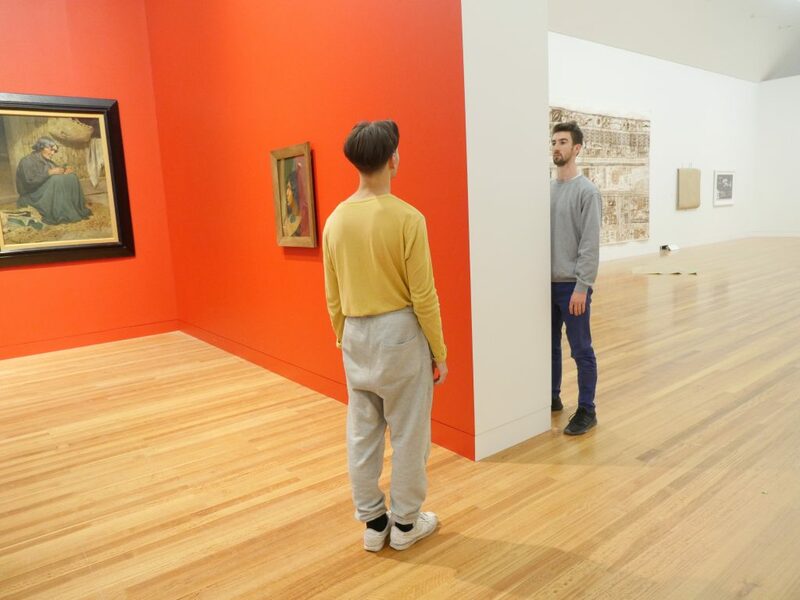 People can expect to arrive at the Art Landing on Level 5 and there will be a host who will be signing people up if they’re interested in doing one of these performative tours. Then this host person will introduce you to your tour guide, and your tour guide will essentially invite you to take a walk with them through the galleries. DC-R: Can you tell us a bit about your relationship to the National Art Gallery, and then also to Te Papa and the opening of Te Papa? I grew up in the old National Art Gallery and National Museum because my father [Luit Bieringa] was the director of the National Art Gallery for a number of years, so those spaces for me and the collection and art work that was passing through those spaces were super impactful on me as a young person. When Te Papa opened it was also the beginning of the formation of BodyCartography Project. We did this big project in Wellington where we did 23 projects around the waterfront and around the city and one of them included a series of duets that happened on the new building here at Te Papa – so we were abseiling off the walls and we were up in the glass walkways, and I think we did a slow-motion walk up the ramp to the marae. I’ve also for the past few years been creating work on the outside of the building at the Performance Arcade, so these spaces are places that I keep returning to. SF: What does it mean for you to have your work in Te Papa’s collection, in the national art collection? I think it’s super heartening that a dance-orientated work has been bought for the collection. That’s super exciting, so I feel deeply honoured by that. I’m also grateful that it happened here, that it happened in the place that I grew up. It’s a complicated history that I have with this institution, but I’m up for engaging with that complexity. At the same time I’m just very excited that it’s happening. What a delight to bring the messiness of live performance and relational practice into the museum!